The return of mice to my hovel (see my Why Every Rat Is Guido posting) reminded me how glad I am that we have hawks in Central Park to help keep the rodent population in check. I have often considered inviting a hawk or owl into my apartment for dinner, but I am very aware how unwise that would be. So I will continue to discourage the mice from entering the hovel, and keep my hawk watching confined to the great outdoors. I saw a young red-tailed hawk in Strawberry Fields on Oct. 5 and one on Oct. 12. While they could be the same hawk, from looking at the pictures and video clips, I now believe they were two different hawks. The youngster on Oct. 5 had trouble keeping the right eyelid open. That could just be a scratch, or it could mean an eye injury or sickness. But the hawk was very alert, and later I heard from friends that after I left, the youngster caught a rat and ate it, then got bopped out of a tree by Ginger, one of the adult red-tailed hawks who hunt between 72nd Street and 96th Street. So I hope the youngster's eye got better. The hawk on Oct. 12 was first seen in Strawberry Fields. The bird had a huge crop, but still took off for the Lake while I was there and caught a huge rat. The bird found a private table, so I didn't get to watch the meal. Later that evening I returned to Strawberry Fields and found the youngster on a tree over one of the paths. I watched the kid until dark. I put together a video that includes both sightings. 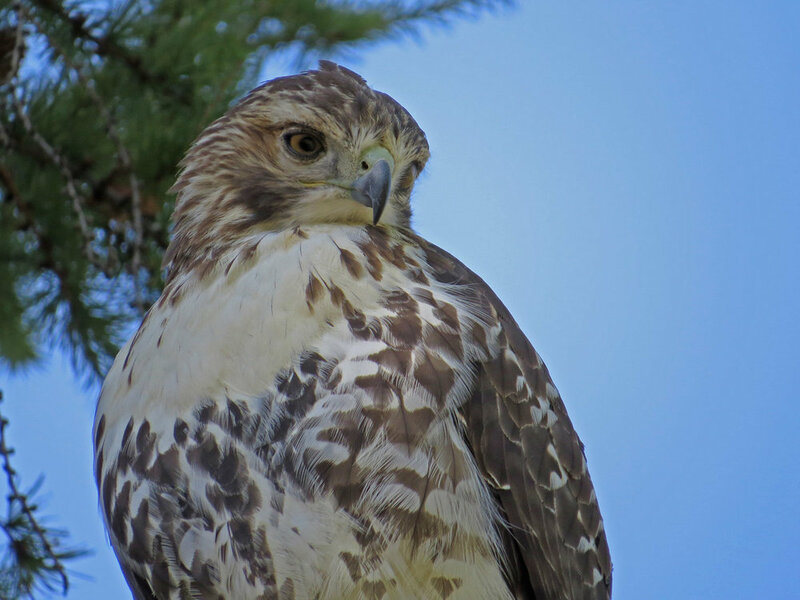 To me, the Oct. 12 hawk seems more fierce and has darker eyebrows, another reason I think they were two different birds. On Sept. 20 and Oct. 10, I got to see Pale Male in Maintenance Meadow and at Turtle Pond. The video shows the zen of this magnificent bird as he surveys his realm. Pale Male seems particularly fond of perching on the top of the gingko tree in Maintenance Meadow, as well as hanging out on the London plane tree there. At Turtle Pond, he favors the pines, but on Oct. 10 he also went into trees near the pond edge.